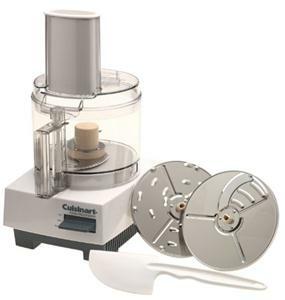 Excelling at some common food processing jobs like kneading bread dough and slicing fruits and vegetables, the Cuisinart DLC-5BK Food Processor falls short in other areas. The rated capacity of seven cups is not an accurate working volume -- three cups of liquid is the maximum working load. Although the useful volume of any food processor is less than the maximum it holds, the DLC-5 has a few other quirks you wouldn't expect. Overfilling the work bowl can cause liquid to leak beneath the lid and around the blade spindle. High speed settings may be too messy to be useful. Depending on your uses, this can still be a good machine for your kitchen. The 600-watt motor can chop up to a pound of meat and knead one-and-a-half pounds of bread dough without overloading. Sharp interchangeable stainless steel disc blades make short work of grating cheese and slicing fruits and vegetables. Pay close attention to amounts, and don't use the highest speed settings when mixing dry ingredients or blending liquids. Backed up with an excellent warranty of five years on the motor and three years on other parts, the DLC-5 disassembles easily but will require thorough hand cleaning.